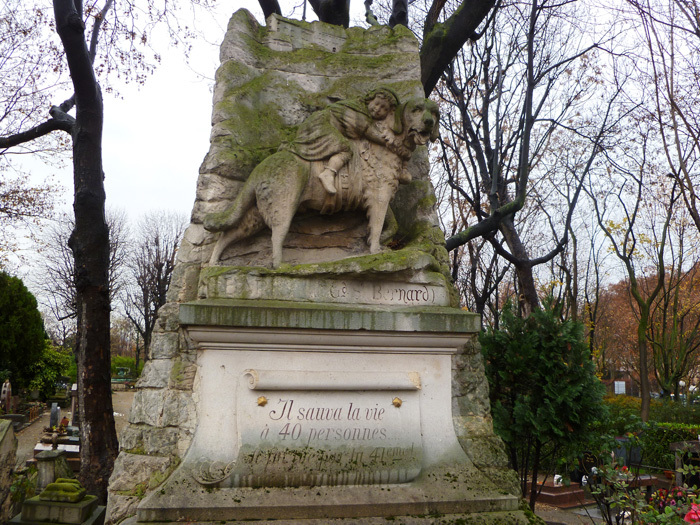 Historically, dog statues were built at the feet of medieval women, signifying the loyalty and inferior place of each in the chivalric order. They symbolized loyalty and served as guides on the journey to the afterlife. In Highgate Cemetery, the grave of Tom Sayers is guarded by his dog. He was a small stature, bare-knuckle boxer and the first to be declared World Heavyweight Champion. In a career lasting 11 years he was only once defeated. His retirement at age 35 was funded by the public (proof of his popularity). However, his retirement was short lived when he died 5 years later. The love of the people for this man was shown once more when they had a statue made of his loyal dog, Lion, to lay next to him for eternity. The Forrest Hills Cemetery contains the resting place of Henry Barnard 1810-1853 and his wife Lucinda Barnard 1813-1913. It is surmounted by a sandstone sculpture of a Newfoundland dog, created by Henry Dexter in 1854. Sallie was the mascot of the 11th Pennsylvania Volunteer Infantry during the American Civil War. She accompanied soldiers into battle and was found protecting the dead and wounded on the first day of the Battle of Gettysburg. She was killed by a bullet 2 years later and buried where she fell. A statue of the brindle-coated pit bull lies at the base of the 11th PA infantry monument in Gettysburg. In 1860 when Johnny Morehouse was only 5 years old, he fell into the Miami/Erie canal. His faithful dog tried unsuccessfully to save him. After burial in Woodland Cemetery the dog would not leave the graveside and died of starvation. A stone was erected in 1861. Visitors to the cemetery have reported the ghosts of Johnny and his dog playing in the cemetery. In Milford Cemetery, Milford, New Haven, Connecticut, USA, there is an 18th century slate headstone memorializing Mary Fowler. It has become famous for the inscription, Molly Tho Pleasant In Her Day / Was Suddenly Seiz’d And Sent Away /How Soon She’s Ripe How Soon She’s Rott’n / Sent To Her Grave And Soon Forgott’n. The inscription gained notoriety and became a tourist attraction. The stone which was stolen in 1992 by vandals made headlines thus continuing to defy the inscription. It was recovered and returned to the cemetery. The gravestone is decorated with foliate engraving and a winged effigy symbolizing the flight of the soul. Old Milford Cemetery was established in 1642. For Ever Flow My Streaming Eyes. Faith, Sweetness, Wit, Together Foind. O View The Chang, And Drop A Tear. Charmed The King Of Terrors Of His Sting & Soften’d Him To A Prince Of Peace. Mrs. Lily Edith Gray, 78, 1216 Pacific Ave., Died Friday, 11:10 a.m., in a Salt Lake hospital of natural causes. Born June 4, 1880, Canada. Salt Lake resident since 1950. Married to Elmer Lewis Gray, July 10, 1952, Elco[sic], NV. Survivors: husband; several nieces and nephews. The site has become popular with fans of the paranormal and litter is often found near the stone. 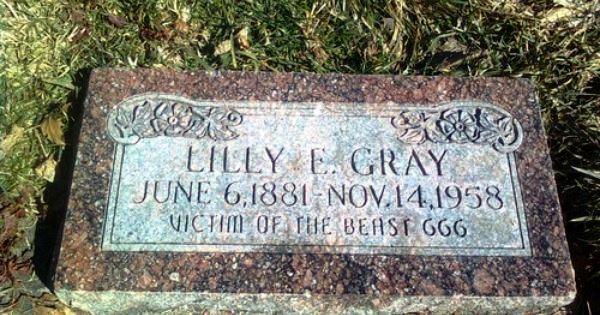 Because of the inscription, it was commonly believed that she was a Satan worshipper. Her grave is also believed to be cursed. There are many suggestions as to the meaning of the inscription, of which several have some merit, but in reality, the truth is lost to the annals of history. The ‘Beast 666’ is a reference to the Antichrist as described in the book of Revelations. Her husband had a history of mental illness and conspiracy theories. ‘Beast 666’ could be his reference to the government, or the medical institution whom he believed had murdered his wife. The flower on Lily’s grave has been reported to be an evening primrose, a flower which has a nickname of Devil’s Lantern. This has been created purely to fit in with the Devil theory. I believe the flower is a buttercup with its tri-cut leaf, and a buttercup is symbolic of cheerfulness. Although Lilly was Roman Catholic she lived in a Latter Day Saints community. It is thought that perhaps Lilly had psychological problems, or Alzheimers, and the LDS beliefs considered her to be demoniacally possessed. My conclusion after researching this subject is simple. Renal disease and Nephrotic Syndrome cause severe swelling and seizures. Considering Elmer’s mental illness he may have believed these symptoms to be the mark of the Devil. Keeping in mind that Elmer selected the grave marker and the inscription it would seem a logical conclusion. 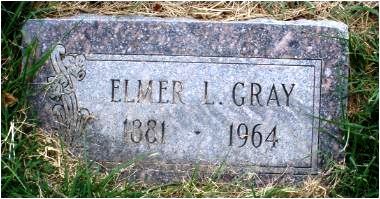 Elmer Lewis Gray, is also buried in the same cemetery, though nowhere near Lilly. Cast iron grave markers and decorations were popular during the Victorian era often with a blank surface for personal dedication. However, the cast iron surface proved difficult to engrave. A solution to this problem was to utilize a stone or marble panel inserted into an ornamental cast iron framework. This post is in honour of the 100th anniversary of the Battle of the Somme which took place between 1 July and 18 November 1916 on both sides of the upper reaches of the River Somme in France. Fought by the armies of the British and French empires against the German Empire, it was the largest battle of the First World War. More than one million men were wounded or killed, making it one of the bloodiest battles in human history. The Battle of Verdun, conducted on a battlefield covering less than 20 square kilometers, became known as The Hell of Verdun. Approximately 230,000 men died out of a total of 700,000 casualties (dead, wounded and missing). I always find graves in the winter more compelling – their suffering seems never ending. Located in northeastern France within the Verdun battlefield, the Douaumont Cemetery has been designated a national cemetery. It contains bodies collected from the battlefield at the end of the war interred in 16,142 graves, making it the largest single French military burial place of the First World War. The simple cross military marker hosts a metal plate engraved with the name of the fallen soldier; last name, first name, middle name; Battalion; ‘Killed In France’ with the date of death. There are also a large number of Muslim markers. Within the cemetery is a memorial known as the Douaumont Ossuary containing the skeletal remains of over 130,000 unidentified French and German soldiers who died on the Verdun battlefield. The tower contains beautiful stained glass windows and a bronze death-bell which is sounded at official ceremonies. At the top of the tower is a rotating red and white “lantern of the dead”, which shines on the battlefields at night. POSTSCRIPT 7/31/2016 just found an interesting article at this link.